The vast majority of my experience with scallops comes from eating them, not cooking them. I’ve also noticed that scallops are often the foil on Gordan Ramsay’s Hell’s Kitchen as he screams at the competing chefs that the scallops are either raw (undercooked) or like rubber (overcooked) before hurling them against the wall. So, in light of the fact that I do like scallops quite a bit, and because I took Ramsay’s rants on television as a bit of a personal challenge, I decided I would see if I could cook them myself. I scanned the internet for methods as well as asking for input on the Castiron Cookware discussion list. I wanted to start out as basic as possible knowing that I can later expand from there. After reading as much as I thought was necessary, I settled on a very basic method. First, I decided upon using a skillet a bit larger than my normal 10 1/4” that serves as my primary cast iron instrument. Having read that scallops need to have room when they cook, I chose a Lodge Pro Logic 12" skillet so that the scallops would not be crowded together. Also from my reading and discussions, I learned that the scallops I normally enjoyed in restaurants were sea scallops as opposed to the smaller bay scallops. Every source I read or person I talked to made preference for sea scallops over bay scallops. The only daunting aspect to the scallops was the price. Keep in mind that we now live in Kentucky, so sea scallops are not a native resource. They have to be shipped in. Although I’ve now found a slightly less expensive source for scallops, the ones you are looking at in the picture above cost more than a dollar each! As I mentioned, I chose a very basic method for cooking the sea scallops. I heated a couple of tablespoons of olive oil in the 12” skillet. Then I cooked the scallops about two minutes each side, lightly sprinkling them with salt and pepper. 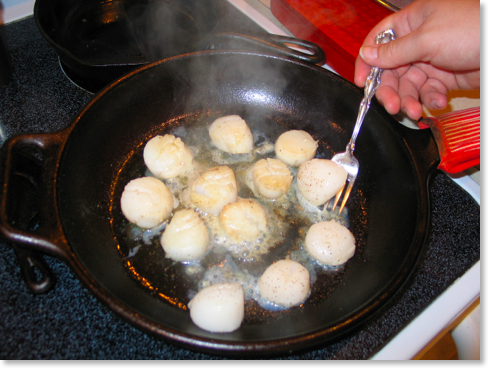 When cooked properly, the scallops will have a light golden brown color to them. The finely manicured hand in the photo above is not mine, but Kathy’s as I took the picture; but you can see the eight that have been turned and the four remaining to be turned. On the night that I experimented with scallops, we had brave guests over for dinner who sampled them with me. I chose to make the scallops an appetizer rather than the main dish not only because of their price, but also due to the fact that I was experimenting with them. Nevertheless, they came out perfect which makes me really wonder about the competence of those competing on Hell’s Kitchen. I mean, I really cannot overemphasize how easy these were to prepare. With the scallops, I simply provided two dishes of melted butter and garlic for dipping, one of which had a few drops of Habanero Tabasco. Everyone thought the scallops were great, even Kathy who rarely strays from steak, burgers, or catfish. Now that I’ve successfully cooked the scallops with the most basic of methods, I can begin experimenting with new recipes. What about you? How do you prepare scallops? Do you have a favorite recipe? Please share your thoughts in the comments below.